One of my favorite sayings is, “Timing is Everything.” Something I live by, yet, something you can’t force. Today was one of those “great timing” days. And, it certainly happened at a great time. Today my brother and sister-in-law flew from a small regional airport in southeastern Washington on a direct flight to Minneapolis, MN. Then, caught a shuttle to Rochester, MN. This morning, before boarding the plane in WA, my brother told me he was a little nervous about the flight and getting connected. I said, “Direct flight, Right?” , “Connection with the shuttle, Right?”, “Everything will work out fine.” And… just as I assured him, their trip turned out fine. Direct flight and connection with the shuttle was made. Timing was great. They arrived at their hotel, ready for the rest of their adventure. They decided to head out for some lunch. Meanwhile I had called the hotel they told me they were going to stay at just to confirm that I had the correct one. I did. Then, I googled florists in Rochester, MN. Google delivered. And what a great one. I always read the reviews and usually take them with a grain of salt. I read about the top florist, it was near the hotel and so I decided to call to talk about what I wanted to do. My plan was to order a bright, colorful bouquet of flowers to send to my brother and sister-in-law since they will be gone away from family on their 32 wedding anniversary. I wanted this to be a total surprise – I told no one, but the florist, until after I placed the order. The florist customer service rep was so helpful and offered to expedite the order so my brother and sister-in-law could enjoy their flowers longer. All with no extra charge. She told me they would do their best to deliver the flowers still today. Keep in mind that where I was calling from is the Pacific time zone, two hours behind Rochester, MN. Later, when my brother and sister-in-law returned to their hotel, the flowers had been delivered. Tears where shed. Flowers were brightening up their room and their adventure. You see, the flowers I ordered were not only to celebrate their 32 wedding anniversary, since we can’t be there with them – that surprise bouquet of beautiful flowers were there so show love and support for a couple we care about greatly. My brother has been battling thyroid cancer for nearly a year. He was diagnosed with Stage 4 Papillary Thyroid Cancer. Early last October he had his thyroid and some lymph nodes removed. In December he went through a pill-form radiation treatment. Monitoring and more testing showed that not all the cancer was gone. It was hiding and smoldering. More monitoring. More scans. More blood tests. Recent scans and blood tests showed the smoldering cancer becoming aggressive. Now at Stage 4C, the absolute worst, his local DR recommended treatment at a better equipped facility, more specialized care. The Mayo Clinic was the choice. She holds the Clinic in high regard, trained and worked there. My brother listened to her, listened to his options and made the easy choice to travel to Rochester. Easy because of treatment options, not so easy because of his family being based in Washington and Oregon. He and his wife are the only ones to travel back to the Mayo Clinic. Not another family member with them to be with there for whatever news or treatment options (such as surgery) that the specialists determine beneficial. We are all at the other end of our phones waiting for news. Praying for good news. A bright, colorful bouquet of flowers seemed like a great reminder of the love and support our family has for my brother and his wife. Was the one thing that I could think of that we could do that would make some difference and let them know WE are with them. Tomorrow is his first appointment at the Mayo Clinic. Tomorrow more prayers, love and support. Today, timing could not have been better. Birth month of my Mom, my brother and my niece. Birth month of several friends and coworkers. First month of the new year, a time for renewal. Also a time to look back, to ten years ago. To the most painful January of my life. Other Januarys I don’t remember so vividly. 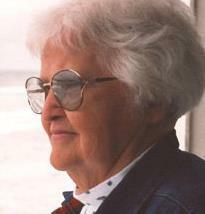 I remember January 2003 as the last twenty days of Mom’s time on earth. Of her last trip to the doctor, when he admitted her to the hospital for observation. During the exam, that morning in early January, he saw something he did not like. Definite progression of the leukemia. I remember time spent in the local hospital…. hours upon hours that changed our family. I remember Dad being in the next room, recovering from prostate surgery. The hospital staff setting things up so that Mom and Dad could have rooms next to each other. As soon as Dad could manage, he could go visit Mom. I remember Mom’s birthday, January 12th, spent in the hospital. The nurses put together a special treat for Mom in celebration. We all appreciated this lovely gesture. I remember how tired she was, yet how very hard she fought the leukemia. I remember her willingness to take medicine that would target its efforts on the cancer cells and I remember the effects of that medicine. It ravaged Mom’s body and last amount of health. I remember her last bone marrow biopsy. She was a courageous, strong woman… she took no general anesthetic, only a local shot. Each biopsy was that way. I was with her that last time and held her hand as the DR drilled into her hip bone to extract the sample of ravaged bone marrow. I remember talks with the oncologist, a family meeting to discuss medication to ease Mom’s discomfort. I remember the morning we had to have the DR start the morphine for Mom, knowing that it would greatly shorten her life. Yet, we had to allow her to be comfortable. 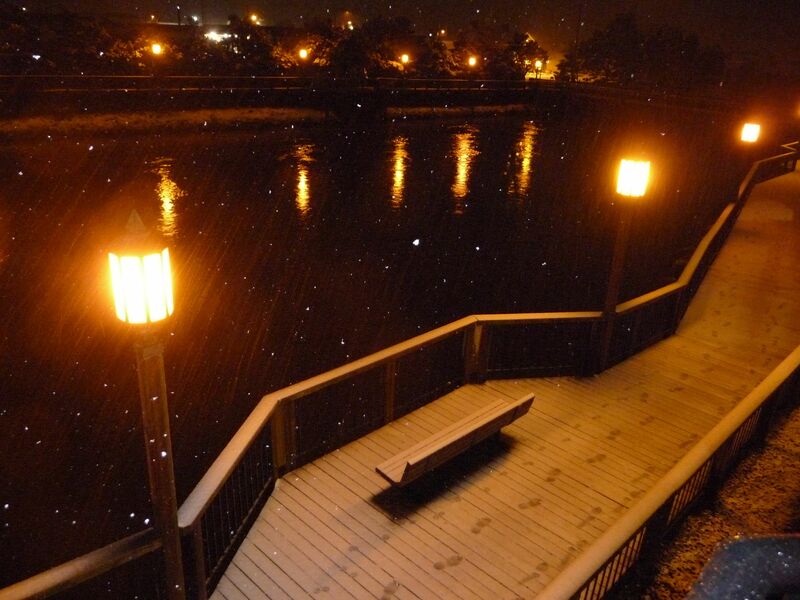 I remember snow gently falling that morning… she would have loved to witness the peacefulness of that day. I remember when she lost the ability to communicate, when the port that allowed medicine and blood products to be administered flipped and was no longer viable…. she then had to have IVs. I remember her last visitors, many supporters of her struggle and of her family. I remember her last moments…. it was a beautiful, peaceful and yet profoundly sad time. It has been ten years and how it feels to me now, it may as well have been ten minutes ago. WOW……………. I totally got a “Helen” Blessing the other day. AHHHHHHHHH, turned around my day……………. all I have to say is..
Just had to share … I was so in need and I received. You see, my Mom, Helen, loved butterflies, dearly loved them. So much so that they are a fond reminder of her gentle spirit. I think that she may have had them as a guardian… now, I do. My husband Jeff also sees them as a guardian spirit and counts them as “Helen blessings” too. The first actual “Helen blessing” I remember experiencing was when I had taken one of my nieces over to the Oregon Coast. This was in summer, after Mom passed away in January 2003. We had stopped at a lighthouse to take a tour. While taking photos, out front, a butterfly – a swallowtail butterfly – followed us around. She even landed on the seed head of some tall grass, pausing just long enough for me to take a good photo. Then she floated away, yet never far from us. I had a calm feeling as if Mom was right there enjoying our day with us. I still get these feelings …. a great calm …. such a peaceful feeling that all will be okay, things will get better. Mom is nearby not about to let anything bad happen. And thankfully, more often she’s just floating by to say “Hi” and enjoy some time with me. This particular day, what felt like a lousy day, ended to be a good day… thanks to the “Helen blessing” and the opportunity for me to see my long-time friend Sue. Mom always knew exactly what I needed and she still does. I know I was directed to Home Depot on that day and so was Sue…. seeing the “Helen blessing” on the way is proof enough. Weather, from bad to good and everything in between. Another version of a ‘pay off,’ as we were treated to blue skies and sunshine after enduring more snow, wind, rain and even some hail. 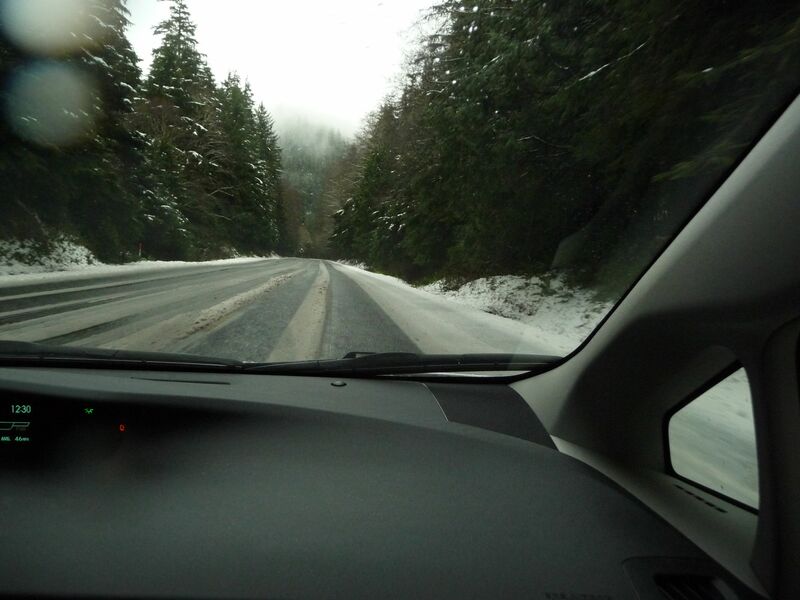 Photos from our vacation of snow, hail, clouds, rain, sun breaks and blue skies and sunshine. After the storms we’d endured, this particular day we chased sun breaks and blue skies. Guess I’ll basically let the images do the talking…. 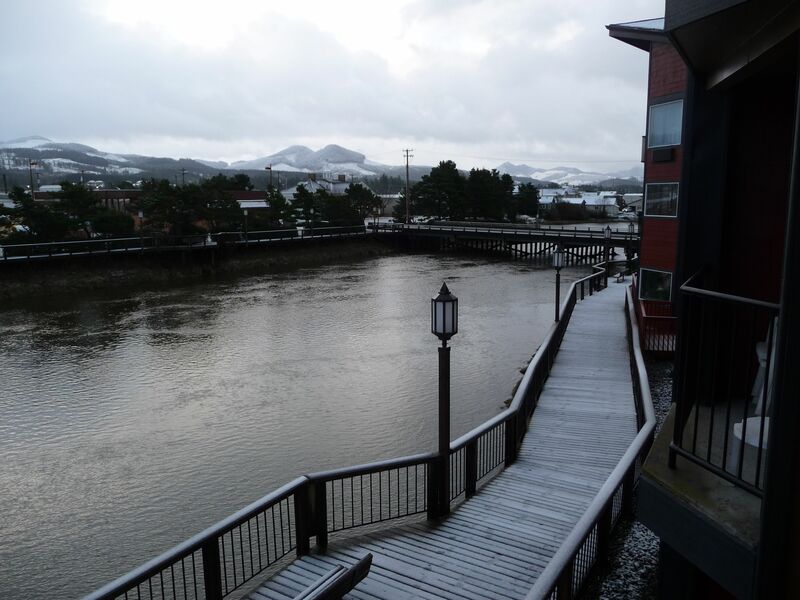 Warm and cozy in our hotel room, we watched the snow come down in Seaside, Oregon. 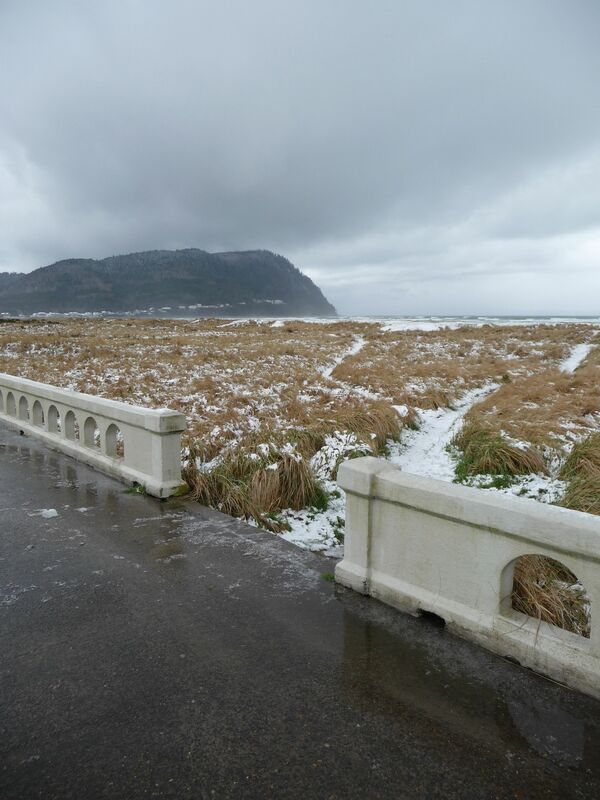 More evidence of the fact that it was snowing at Seaside. Early morning the next day. 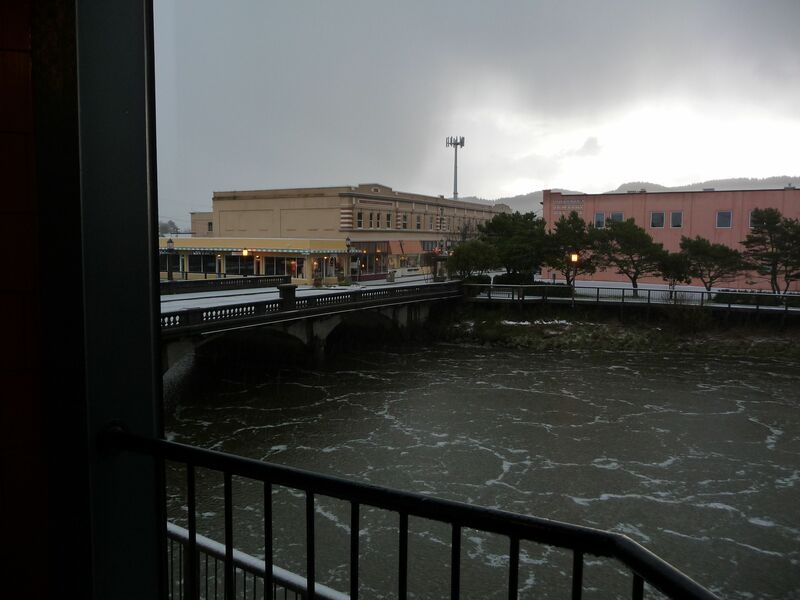 Another storm…. this time hail. 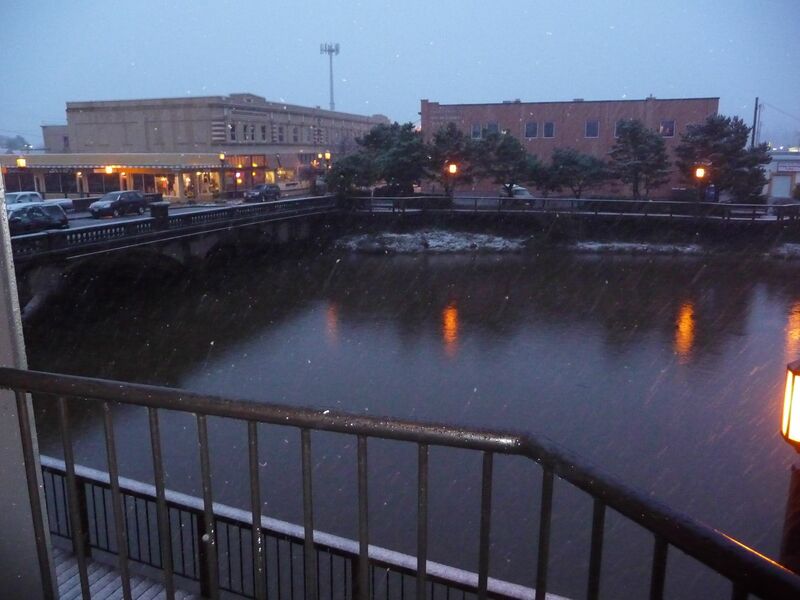 Yes, that is HAIL floating on the river. It came on hard and fast and created its own ‘rafts’ on the river. 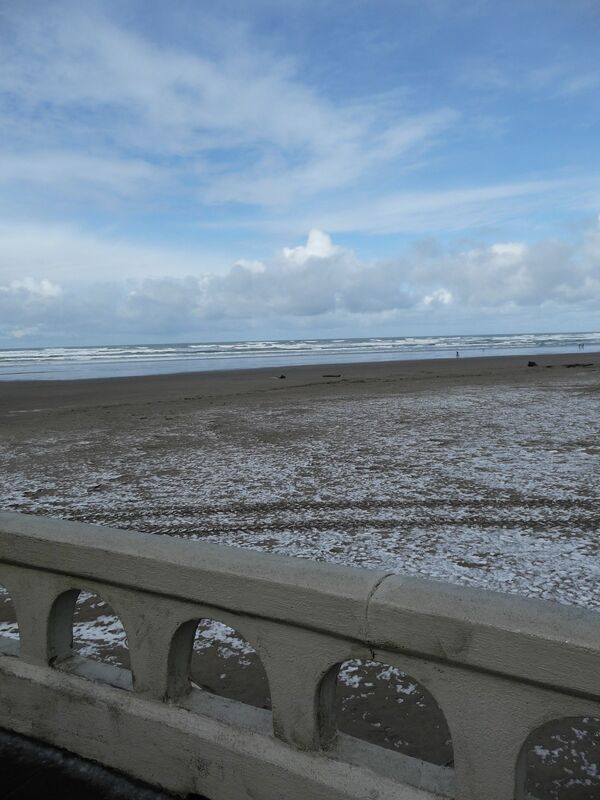 Hail and snow on the beach at Seaside. Another vantage point. 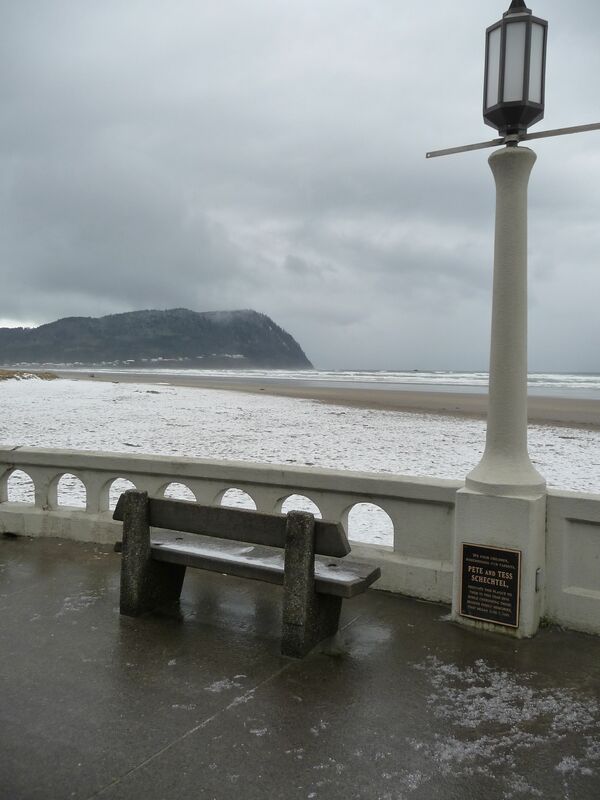 Snow on the beach at Seaside, Oregon. 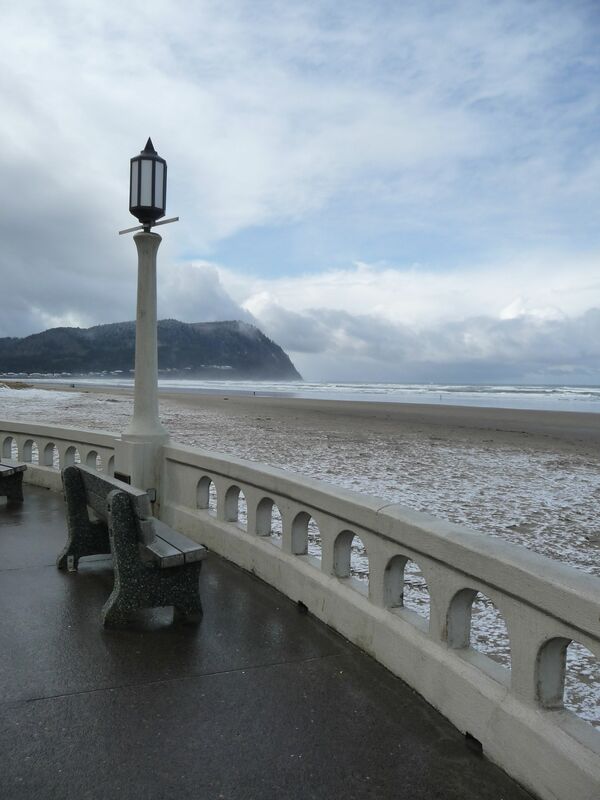 I’ve wanted to see snow on the beach and now I can say I have. 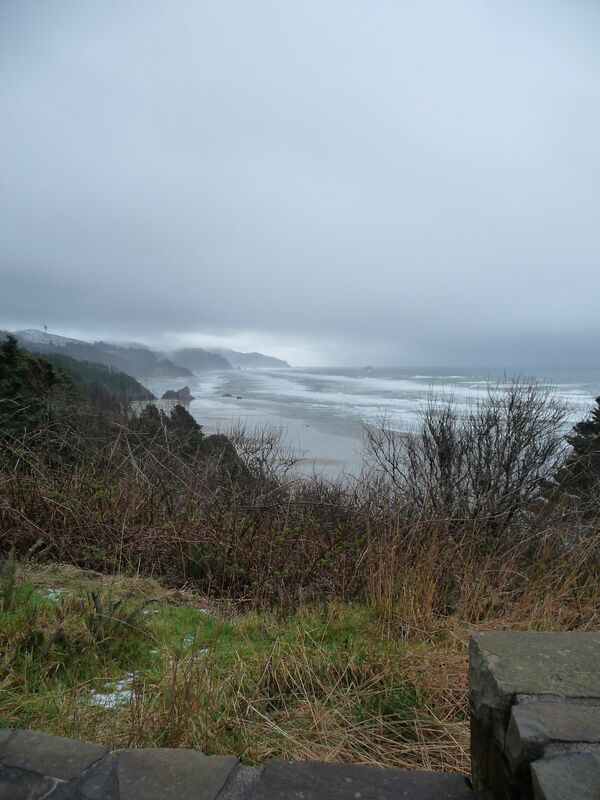 — Tillamook Head is in the distance. “End of the Trail” statue at the turn around at Seaside. 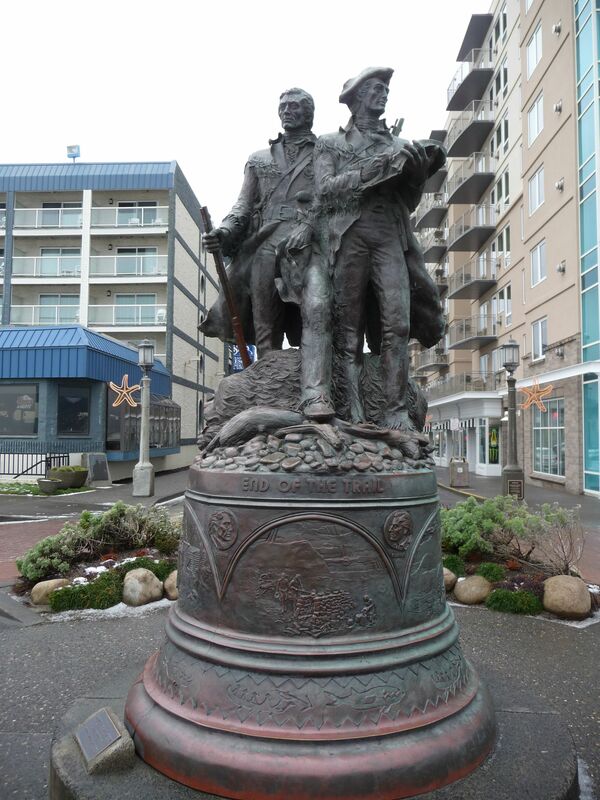 Explorers Lewis & Clark are depicted on the top. 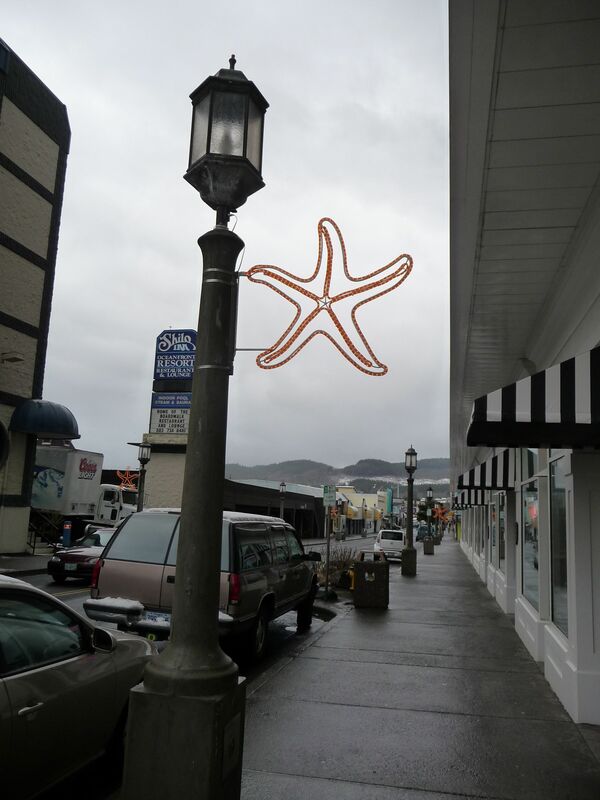 Love the “Starfish” street lights at Seaside, Oregon. I know, I know… “Big Surprise! 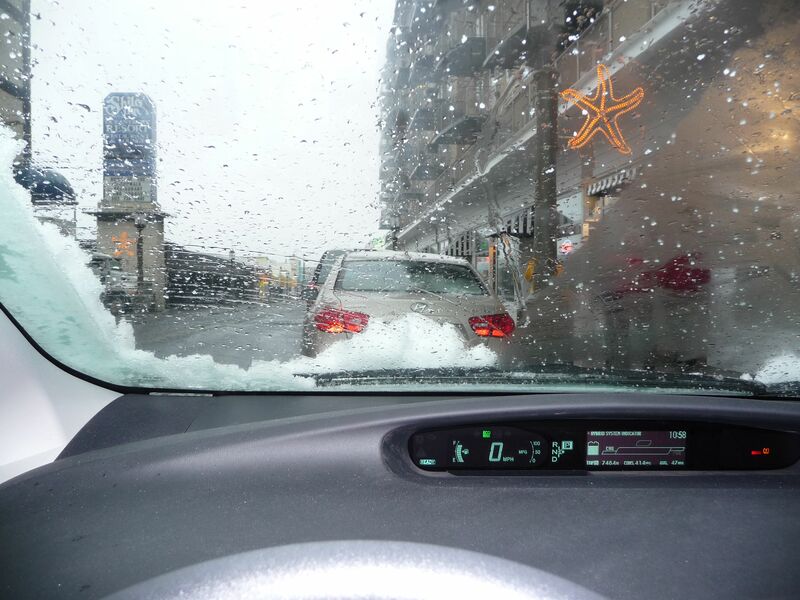 !” … More snow on the windshield of the car. Later…. we were treated to blue skies, beautiful blue skies!!! Snow, Blue Skies and Sun Breaks!!! AAAHHHHHHHHHHHHH…. 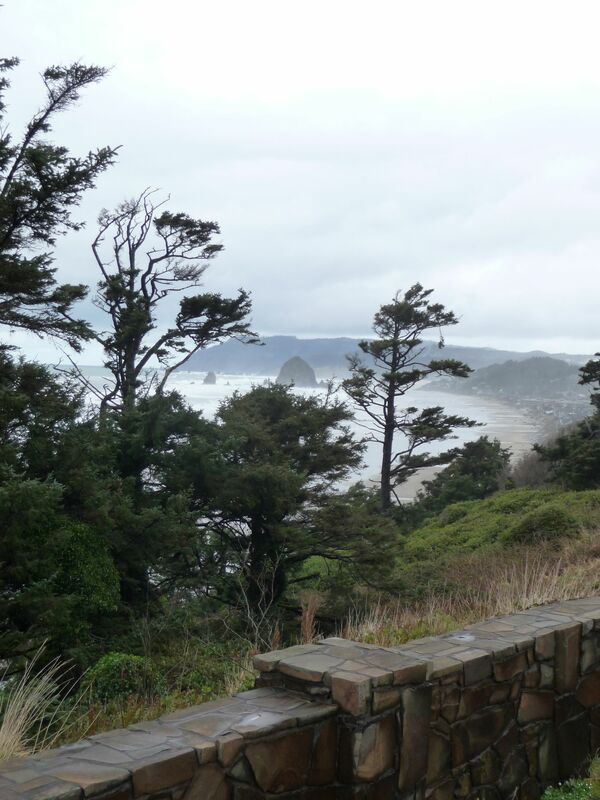 Vista point south of Cannon Beach, Oregon. Beautiful scenery despite the look of the stormy weather to the south. More snow in the coastal hills. 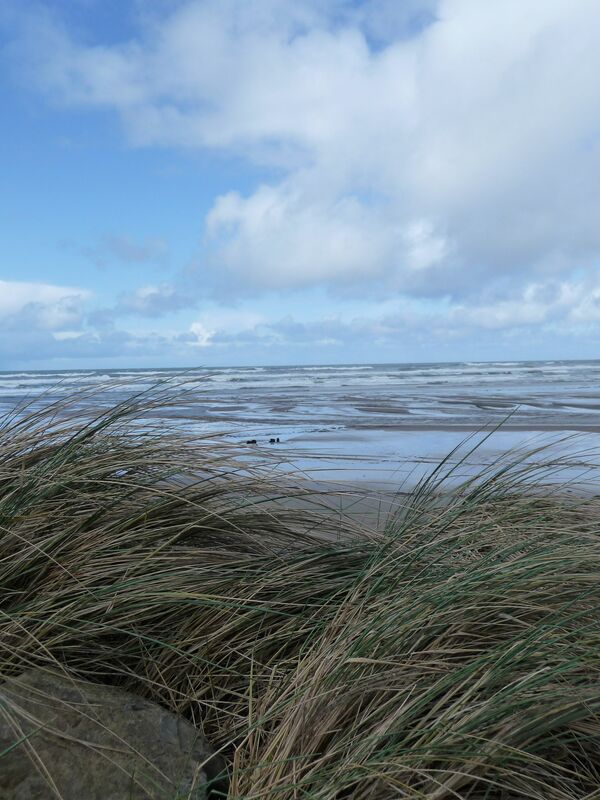 Blue skies and sunshine at Rockaway Beach. What a treat!!! 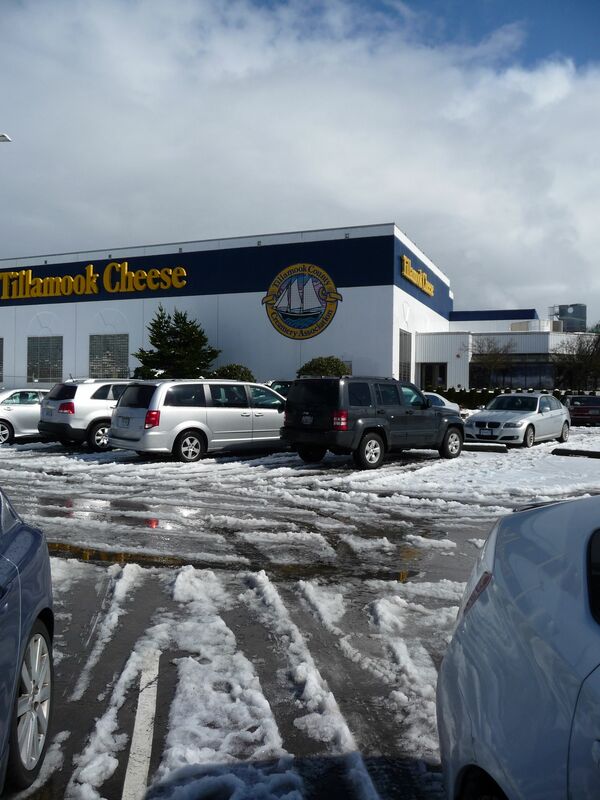 Tillamook Cheese Factory with snow in the parking lot. Real sloppy, wet snow. This morning I was a wee bit late getting out the door and off to work. Just over the six mile mark of my eleven mile commute there was a car accident. Must have been a messy one. Firefighters, rescue crews were called to assist (and clean up). Traffic merged into one lane and slowed to a crawl. This is an unusual site on my commute through rural scenery getting from one small town to a larger small town. While I have yet to learn what happened this morning, it was a messy accident. One car that had been attached to a tow truck had suffered a front-end bashing; possibly they rear-ended the car that I presume left an oil or gasoline spill on the highway – if that was the case that car had already been moved. There were skid marks, in more than one place. I can only imagine the mayhem of this accident. Thankfully, I can only imagine. Yes, I thank my lucky stars. I also thank my Mom. You see, many years ago I avoided being in or nearly in a fatal accident on a freeway, thanks to my Mom. I had been ready to leave my home, south of town, and set out on my way to the community college, north of town, when my telephone rang. Thankfully all I had was a land-line then. On the other end of the phone was my Mom. We chatted for a while, then I mentioned that I really needed to get out to the computer lab at school. We said our ‘good-byes,’ ‘talk with you laters,’ and I went on my way. About half way from my home to the community college there had been a terrible traffic accident. Someone had slammed into the concrete of an overpass. And recently. Yes, “Timing is Everything,” and Mom was usually always good with her timing.